After gaining six stars, the Rhino and occasional on-foot military soldier will appear. Soldiers are armed with AK-47's at all times. 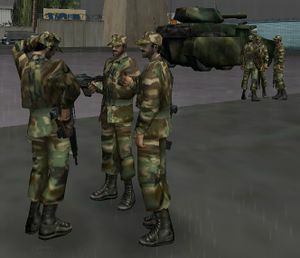 While encountering an occupied Rhino, the player cannot hijack the occupied Rhino. However, there are two ways the Rhino will react depending if the player is on foot or in a vehicle. If the player is in a vehicle, the Rhino will immediately fire at the player's vehicle setting it aflame (but not blow it up giving the chance for the player to bail out and save his or her life). However, if the player is on foot, the Rhino will reluctantly fire giving the player ample time to escape. The very slow speed of the Rhino makes it easy for the player to outrun it on foot. The Rhino will eventually fire at the player if the player stays in range on foot for too long. A direct hit usually kills the player unless the player has full health and full armour, but will reduce the health to roughly 25% and armour to 0%. In the GTA III Era the Rhino tank (which chases the player at six stars) does not fire it's main gun. 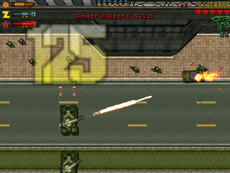 However, in Grand Theft Auto: Chinatown Wars the Rhino is programmed to use its turret to full effect, blasting the player into oblivion.